It was magic Monday for Requinto who added another three winners to his excellent record via a double at Windsor and a conditions scorer in France. 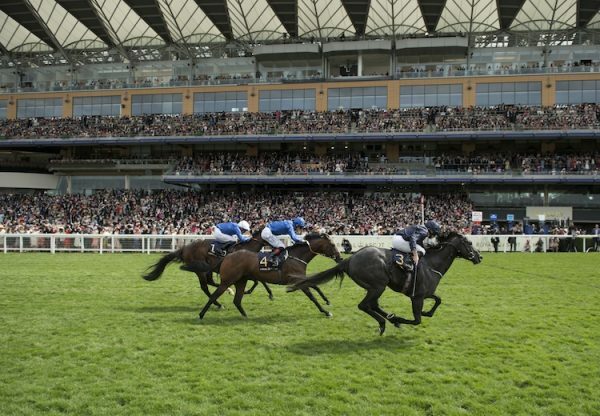 The Richard Hannon-trained newcomer Groupie (2f Requinto-Amour Fou, by Piccolo) set the Windsor ball rolling when winning the first division of the six-furlong novices’ event. Bred by John Troy, the Jenny Powell-owned filly (pictured, courtesy of @rhannonracing) showed great acceleration to score and could drop back to five furlongs for her next start. “Groupie hit the gate very well and was probably in front soon enough but she has got plenty of speed and we will not be frightened to drop her back to five furlongs,” Hannon told the Racing Post. Half an hour later, division two of the novices’ races went to another impressive daughter of Requinto in High On Love (2f Requinto-Cant Hurry Love, by Desert Prince). The Charlie Fellowes-trained filly, bred by Ethel Anne Molony, was sent off favourite on the back of a promising debut at Newmarket and she could now be heading to Royal Ascot. “I like High On Love a huge amount as she has always shown a lot at home. If she comes out of this in good order we might think about taking her to Royal Ascot for the G3 Albany Stakes as the stiff six there should suit,” said Fellowes. The afternoon had begun with victory in a Cagnes-sur-Mer conditions event for La Dame En Rouge (2f Requinto-Philosophers Guest, by Desert Prince). The filly was bred in France by Haras du Cadran and Ms Aydi.